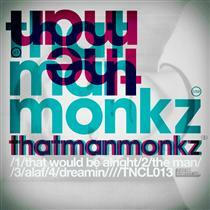 Tone Control Music proudly introduces our new signing ‘thatmanmonkz’. This debut EP, the man explores Detroit inspired deep house with jazz, disco and soul influences apparent throughout. Several tracks feature vocalist and multi-instrumentalist, Pete Simpson (Sunburst Band) while title track, The Man takes a heavier sampler/drum machine based route for darker tastes. Ross Orton (Arctic Monkeys/M.I.A.) helps out on mix duties to complete this Steel City showcase. Who is thatmanmonkz? Scott ‘thatmanmonkz’ Moncrieff is a much-hyped DJ who has shared the decks with heavyweights Carl Craig, Grandmaster Flash, Phil Asher, Recloose and Roots Manuva among others. Sharing a flat with Arctic Monkeys and M.I.A producer Ross Orton led to a crash course in production techniques and analogue synths, which inspired him to join forces with Toddla T (Radio 1) to form Small Arms Fiya. Small Arms Fiya created numerous releases and remixes over their 3 year collaboration which included Jersey Street, Nubian Minds, Roots Manuva, Domu, Mark Rae, The Elektrons and Lo Tek Hi Fi. Their debut EP with Pete Simpson, and follow up with Ayah Marar was received with impressive acclaim from Benji B, Ross Allen and more. Small Arms Fiya re-launched in 2011 after a hiatus which ‘monkz used to experiment with new musical directions. Since then he has been busy producing, arranging, remixing and DJing – headlining Sheffield’s infamous Kabal Warehouse Party, Cargo, and playing alongside Fatlip from The Pharcyde, Hackman, and Martelo. With this debut solo release, ‘The Man’ EP forthcoming on Tone Control Music, imminent 12’s from his ‘S & M’ project with Daniel Swain, and various remix/production duties, expect big things from thatmanmonkz!